Pilates were first created by Joseph Pilates for the intention of strengthening the human mind and body but pilates were later refined by Stott Pilates (see the history of pilates here). The physical goal of pilates is to increase flexibility and strength, without adding muscle mass. Pilates are a series of controlled movements specifically designed with different exercise apparatus'. 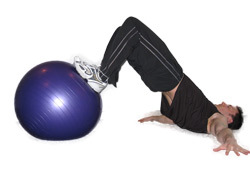 Now Pilates are completed with an exercise mat sometimes exercise balls and bands but this equipment is not required. Pilates can be done with just bodyweight which makes this type of exercise ideal for the masses. Increases your basal metabolic rate (BMR) due to the increased energy expenditure and focus on increasing musculature. Promotes balance and body awareness through a series of fine controlled movements. Helps reduce stress due to somewhat intense exercise (source). Decreases overall body fat percentage with continuous exercise for a mimimum of 20-30 minutes. What equipment should I get to do pilates? One of the great things about pilates is you don't need expensive equipment to perform Pilates. All you need is an exercise mat and you have everything you need to perform the new fad of fitness exercise. Some people like to purchase pilate videos or DVD. This may be helpful if you need a little encouragement and someone to guide you during your workout. What are some good pilates workouts? Pilates do not really build much muscle when compared to weight training doing a basic beginner workout.